Although a semi-obscured project Last Dominion Lost do have a certain aura surrounding them which is particularly derived from the legacy of its various members. Thus in their original early 90’s incarnation the project included two former SPK members – Dominik Guerin and John Murphy – who teamed up with John Evans to complete the trio. Yet the material recorded during this initial formative period remained unreleased until 2004, when at the time Tesco Organisation issued ‘The Tyranny of Distance’ album as a historic archive of the group’s earliest recordings. To then fast forward another decade, the sophomore album has now been issued which includes recent recordings made between 2012 and 2014. Noting that Dominik Guerin has departed the group, for this album John Murphy and John Evans remain as the core members, who have enlisted the input of Julian Percy alongside guest contributions of Ash Wednesday, Till Brüggemann, Annie Stubbs, David Barrett, and Ricky Garrett. What is revealed on initial listens is that ‘Towers of Silence’ is very much a direct continuation of the early industrial era – aka the pivotal 1970-80’s period during which the genre base elements were being set down. Likewise given the pedigree of core members a direct lineage can be drawn to the tribal infused, percussive industrial sound of early pioneers SPK. Certain tracks also draw linage with early industrial experimental soundscape works of Current 93, where incidentally John Murphy was involved with their seminal classic ‘Dog’s Blood Rising’ album. However is not like Last Dominion Lost have purposefully aimed to sound ‘retro’ or ‘old school’, rather this is simply the project going about creating their brand of industrial music which reflects the both legacy of members and length of time being involved in the industrial and related underground music scenes. Also what sets the sound ‘Towers of Silence’ apart from being merely being regressively focused is the James Plotkin’s mastering which has provided the album a sharp, loud, forceful and modern tenor. Covering a wide myriad of tonal territory across its 10 compositions the range of sonic elements include shuddering/ wavering analogue synths, clanging metallic rhythms, maudlin vocals (spoken, chanted and disembodied evocations), wailing horns, stoic martial kit percussion, disorientating tonal pulses, warbling sound layers, etc. Yet despite the diversity of sound on display one constant characteristic is an unnerving aura which weaves through ‘Towers of Silence’, regardless of whether the tracks encompass subdued soundscapes or embody industrial percussive clamour. The first cut ‘Stagma’ represents a strong opening statement of clanging metallic textures, revving atonal synths, sporadic heavy percussion and aggressive vocal treatments – yet this piece hardly characterises the balance of the album. The following ‘Sektor F’ then seeks to balance brooding analogue synths and gradually elevating metallic industrial outbursts (which becomes rather chaotic towards track’s end), complete with cyborg vocals which replicate those of the Daleks in their sonic treatment and which completely works despite what this description implies. On ‘S.E.A.T.O’ the group merges an industrial soundscape with tribalised percussion, where the lamenting vocal line of John Murphy informs us to: “Leave us. We don’t Want You. You’re not relevant anymore. You have nothing that we need” etc. Here the vocals are drawled over subdued soundscape and rolling tribal/ militant percussion, which in their playing style are also clearly that of Mr Murphy – being forceful but equally understated. ‘Caesium Sunrise’ then features as an excellent queasy atmospheric soundscape of wavering droning synths, garbled vocals and ritualised industrial clamour. ‘Kavam’ potentially represents the most typical genre type track of the album, being a minimalist and loose experimental industrial soundscape which acts as a base for interview dialogue sample of a woman talking through a disturbing imprisonment ordeal. Whilst not a bad track is a little lacklustre compared to the balance of the album (…and somewhat tellingly this piece is relegated to the end of the first side of the vinyl). Moving back into a strongly focused tribal/ militant/ industrial style side B opens with ‘Hexatom’ – a track of sparse percussion, wailing horns and dominant half sung vocals. Although the track ‘Chlorpromazine’ would seem to be making a direct reference to a pharmaceutical drug used to treat schizophrenia, here the composition’s hazy and anxiety infused atmosphere is clearly more akin to as internal soundscape of a mentally unhinged mind. ‘Chöd Ritual’ then arrives as another album standout and spanning yet more deviating terrain where percussive hand drumming, warbling vocalisations and sustained eastern tinged horns generate a track of sweepingly hazy tribal industrial. For the final two album cuts ‘Minol’ spans a loose industrial/ noise soundscape with creaking metallic debris, whilst the final title track follows a similar path but is augmented with militant percussive thrum and wailing ethnic tinged textures. Given that any new material from Last Dominion Lost was not an expected proposition, this has allowed the project used the element of surprise to deliver a categorically authoritative and quintessentially industrial album – where the descriptor of ‘industrial’ is used in widest context of the term. The artwork and presentation of the album is also perfectly suited, being slick and understated and incorporating visual representations of the ‘Towers of Silence’ and the religious practice of using such structures for sky burials. 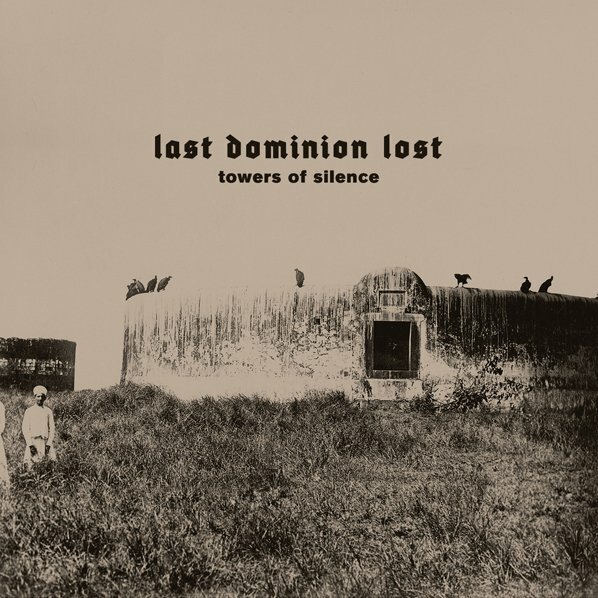 Whereas the debut was very much a historical document and testament to the past and early phase of the project, ‘Towers of Silence’ is very much a distinct marker for the rather promising future of Last Dominion Lost. However let’s hope it is not another decade before the next album surfaces. This entry was posted in 2014, industrial, ritual, Silken Tofu, The Epicuriean by noisereceptor. Bookmark the permalink.